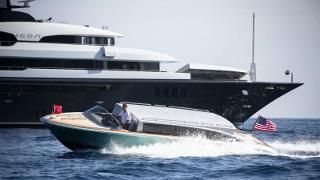 American yard Hodgdon Yachts has launched a new 10.5 metre limousine tender, a custom design with a striking sea foam green exterior. Styled by Michael Peters Yacht Design, the custom limousine is the tenth tender launched by Hodgdon in the past five years. With a flared bow and curved transom, this stylish tender is another great example of Hodgdon’s design flair, with custom fabricated stainless steel detailing and a flush-fit anchor locker. The US superyacht builder recently won the Tender Design Award at the 2016 ShowBoats International Design Awards. The interior features leather and wood veneers, with seating for 11 guests, including two oversize seats for the owners. Designed to compliment sophisticated superyachts, the tender certainly doesn’t look out of place zipping around in front of the 67.6 metre yacht Icon. Key features include a pair of side windows, which electronically fold out for both port and starboard boarding access. What’s more, the entire salon hardtop can be hydraulically raised to create full-height headroom and 360-degree visibility. On-board amenities include a high definition entertainment system, refrigerator, bar, and climate control throughout. Founded in 1816, Hodgdon is the oldest shipyard in the USA with 422 hulls to its name. This custom limousine tender has been launched as part of the company’s bicentenary celebrations and is offered for sale, priced at $1,470,000.